Our speaker for the next Local History Evening on Thursday April 25th is David Whitehead who will give an illustrated talk about Humphry Repton in Herefordshire. This is particularly relevant to us as we have local examples of Repton’s work at Garnons and The Weir at Kenchester. As usual the talk takes place at the New Bridge Community Centre at Bridge Sollars at 7.30pm, admission £3 to include coffee and biscuits. That’s the plan but it’s likely that the May talk will have to be cancelled if the community centre is being used for EU elections – Electoral Services have booked it so presumably they are expecting the election to happen. In that case I will try to book Allan for the November slot. Here are the results of ‘Uncontested Election’ for our parishes, plus the Poll Notice for the Stoney Street ward. Here are the Statements of Persons Nominated for all the parishes in the Bishopstone Group and also for the Stoney Street ward. 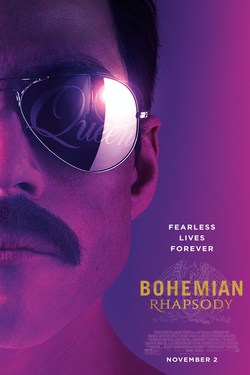 On Saturday 6th April we will be showing Bohemian Rhapsody, the award winning story of Freddy Mercury and Queen from his joining the band in 1970 to their Live Aid performance at Wembley Stadium in 1985. At our meeting on Thursday (28th) John Macklin will present an illustrated talk entitled Lost Country Houses of Herefordshire in which he will remind us of the many great houses in the county which were destroyed during the 20th century. The talk will take place at the New Bridge Community Centre in St Andrew’s church at 7.30pm, admission £3 to include coffee and biscuits. Visitors welcome. Bishopstone – Saturday 6th April 2019 at 10.00am. Mansell Gamage – Saturday 14th April 2019 at 10.00am. Byford – Cllr Hubbard and Cllr Holmes are organising a party to clear up Solitary Island where there is a problem with fly tipping. 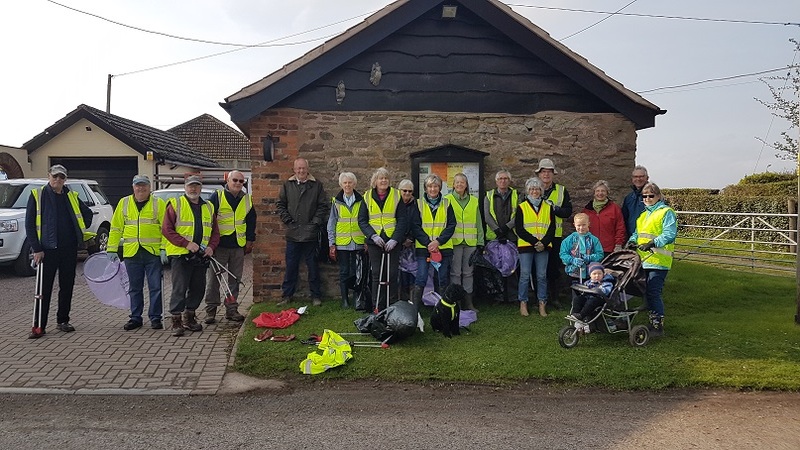 There was a great turn-out for last year’s litter pick with over 15 bags of rubbish collected in Bishopstone alone. We look forward to your help again this year. 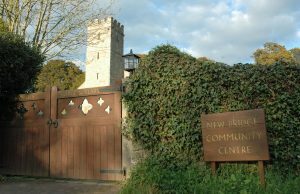 The New Bridge Community Centre is a small membership charity whose purpose is to run a community centre for the benefit of the residents of Bishopstone, Bridge Sollars, Byford, Kentchester and Mansell Gamage. The centre promotes and facilitates educational, training and social activities. We do this through holding film nights, talks, coffee mornings and many other activities. The charity is managed by a committee of trustees elected by the members at the AGM. Helping the Charity to run the Community Centre for the benefit of local residents. Electing the Trustees who run the Community Centre. The chance to become a Trustee yourself and take decisions about our activities and events. If you would like to become a member, please write your name and contact details in the membership book held at the Community Centre or email the Secretary – hubbard7jz @ btinternet.com so details and the agenda for the AGM can be sent to you. Everyone is welcome, you don’ have to be a member to use the Centre. Following audience favourites, ‘Stories from the Hop Yards’ and ‘Chewing the Cud’, ‘a new film ‘Carousel: A Herefordshire Life Through a Lens’ will be shown 11-12th March in Hereford and 13-14th March in Malvern. This new Catcher Media film delves deeper into the Derek Evans’ photographic archive from the 1950s-1970s, bringing you the stories behind his photographs of the county, from the May Fair to Hereford United, from the Fownhope Heart of Oak walk to jazz clubs, from childhood to politics and much more. prints, scrapbooks full of newspaper cuttings, photo journals, and daily log books of the studio’s activities. Carousel will screen at the Courtyard Hereford on 11th and 12th March, and then at Malvern Theatres on 13th and 14th March 2019. See where the other village screenings will take place. Just enter your post code in the online form to find out. 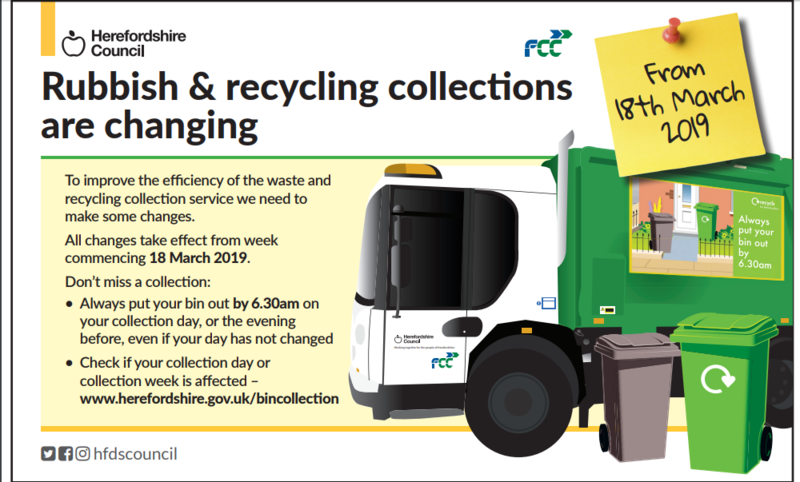 All changes take effect from week commencing 18 March 2019. Don’t miss a collection: Always put your bin out by 6.30am on your collection day, or the evening before, even if your day has not changed.